I first suspected this might be Ectemnius or somewhere in that neighborhood. The distinctive pattern on the thorax should help, but I don't see a match in the Guide. Any suggestions? i was stunned by your wasp and followed the developments although had nothing to contribute myself... Keep working! thnx! 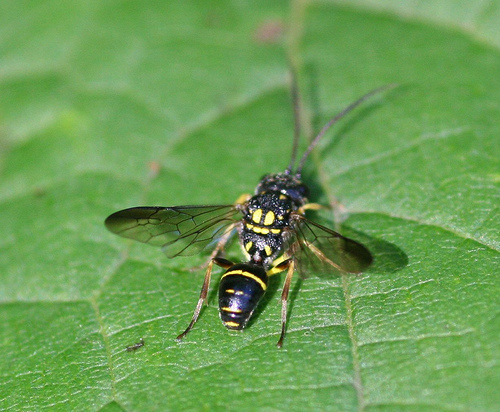 No, much more interesting: this is a member of the rare parasitic wasp family Trigonalidae. Excellent find! With only 3 distinct eastern species, does that then make this Taeniogonalos gundlachii? The only other two trigonalid species (Lycogaster pullata and Orthogonalys pullchella) look quite different; Lycogaster is almost completely black and Orthogonalys looks very much like an ichneumonid. Awesome find by the way! I've always wanted to see a live trigonalid!